Avenches has a well-preserved Roman amphitheater, several ruins, a Roman museum, a Renaissance castle and interesting medieval buildings. Avenches, the capital of Switzerland during Roman times, is an interesting small town to visit just off the Autoroute A1 between Lausanne and Bern. The town is particularly known for its Roman amphitheater that is still in frequent use for operas, rock festivals and other performances. The medieval tower next to the amphitheater has an interesting Roman museum while many further Roman ruins can be visited next to the modern town. 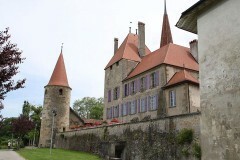 The most prominent medieval building in Avenches is the castle, which received a Renaissance makeover but several watch towers and other buildings survived to the present. The Romans conquered most of what is present-day Switzerland around 58 BC when Julius Caesar defeated the Helvetic tribes at the Battle of Bibrate. From 15 BC, Aventicum – the present-day Avenches – was the capital of Helvetia. In 275/277, the Allemans overrun Aventicum. Although the city was partly rebuilt, it never recovered its former glory. At its peak, the Roman town had a population of 20,000 – presently it is just over 3,000. By 455, Roman rule seized completely in Switzerland. 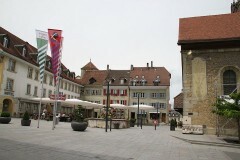 Although a mere shadow of its former self, Avenches remained populated after the Roman era. During the Middle Ages, the town people moved up the hill for easier defensive purposes – the confident Romans had their city in the plains. Even today, large parts of the former Roman town remains next to the modern town with free access to the Roman ruins in the open countryside. 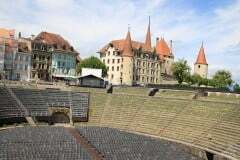 The top tourist attractions in Avenches are undoubtedly the Roman Museum and amphitheater. The amphitheater is still in frequent use for concerts and festivals. 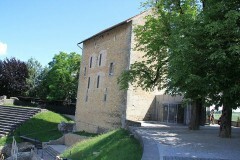 The Roman Museum is in a medieval tower built on the edge of the amphitheater. Its best-known item is a very important golden bust of Marcus Aurelius. See Visit the Roman Museum and Amphitheater in Avenches for more details. 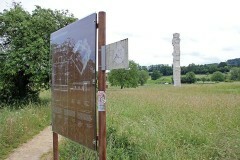 A flyer with maps and a hiking route to the Roman ruins is available from the Roman Museum or tourist office. (Also look for the useful but separate Medieval Avenches brochure and map.) The former Roman town was bigger than the present Avenches and located mostly to the east of the modern town. It is a pleasant, relatively flat walk on marked paths to the ruins, former thermal baths, and theater. The restored eastern tower, as well as several sections of the original Roman town wall, shows just how extensive the limits of Aventicum were. After the Roman era Avenches was briefly a bishopric but increasingly governed from Lausanne and eventually as part of Burgundy and Savoy. During the thirteenth century, the town mostly moved onto the hill where the castle and Maria Magdalene Church were already established in the previous century. As with most of the region, the Bernese took control in 1536 and ruled Avenches until the Napoleonic era. Since 1803, Avenches has been part of canton Vaud (Waadt), as is clear from the green and white flags waving all over town. 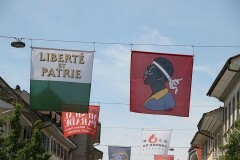 The flag of Avenches itself features a black head. The origin is uncertain but assumed to be a reference to the Moorish Saracenes from North Africa, via Spain, that plundered much of the region during the eleventh century. Most of the castle is not open to the public but it worth exploring the exterior including a very lovely Renaissance portal. Much of its present appearance is due to the work done by the Bernese shortly after taking control. Several further medieval towers survived, which contribute to the inviting panorama Avenches offers to passerby on the nearby highway. 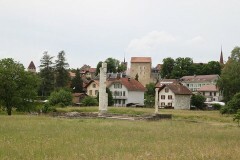 Between the castle and theater, note the small monument for Ernest Failloubaz – he owned the first Swiss pilot license. Aged 18, his flight from Avenches to Payerne on 28 September 1910 is considered the first flight in Switzerland between two cities. This flight contributed to the establishment of the Payerne Aerodrome still used by the Swiss Air Force and the Clin d’Ailes Museum of Military Aviation. Back in Avenches, Rue Central is the main road through the old town with several interesting facades and many cafés and restaurants. The protestant Mary Magdalene church has an eleventh-century apsis but most of the building dates from around 1710. The sundial and zodiac calendar on the church are surprisingly accurate. The Hôtel de Ville across the road is similarly from the eighteenth century. The Romans picked Aventicum as capital for its good strategic location on the main route from the Lake Geneva region – and more importantly the St Bernard pass through the Alps to Italy – to Germany and northern Europe. This strategic position survived to the present – Switzerland’s most important Autobahn, the A1 from Geneva to St Gallen via Lausanne, Bern and Zurich still passes within sight of the old town. Getting to Avenches is thus very fast by car from Geneva (1h15), Lausanne (1h), or Bern (0h40) on the Autoroute A1. From Lausanne, a very pleasant option is the N1 (E25), a smaller but more direct road parallel to the A1, leading through lovely countryside and passing by Moudon and Lucens (Sherlock Holmes Museum). The main intercity railways from the Lac Léman region pass Payerne by – from Geneva trains mostly go via Neuchâtel and from Lausanne via Fribourg to Bern and beyond. The local train connects Payerne (S-Bahn to Lausanne) and Murten / Morat (trains to Bern, Fribourg, and Neuchatel) via Avenches. Getting to Avenches from Lausanne on public transportation takes around 90 minutes (change trains in Payerne or change to a bus in Fribourg). From Geneva Airport (GVA) requires just over two hours (change trains in Neuchatel and Murten – generally the best option – or travel via Lausanne). From Bern to Avenches takes just over an hour – changing trains in Murten is generally the best option. The Avenches region is relatively flat – with views of the Alps and the Jura mountains – making the region very popular with cyclists and hikers. 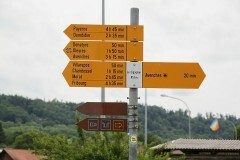 Many routes are available from here towards Lake Neuchâtel.